Mortality and morbidity associated with acute kidney injury (AKI) are high. 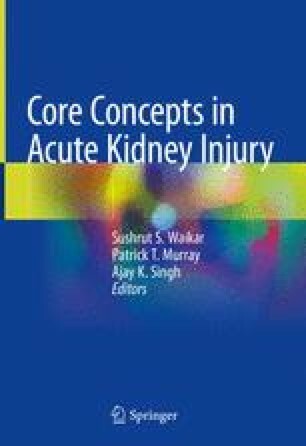 Depending on the definition used, AKI has been estimated to occur in 3–30% of hospitalised patients and up to 60% of critically ill patients, with severe AKI that requires dialysis complicating the care of more than 5% of patients in intensive care. It is an increasingly important global clinical problem with adverse effects on patient prognosis and healthcare costs. The causes of AKI range from, but are not limited to, septic shock, major surgery, cardiogenic shock, hypovolaemia, nephrotoxic drugs, liver disease (hepato-renal syndrome) and obstruction. This review will examine the pathophysiology of AKI, including the human evidence, mechanisms, pathological correlations and animal models. Mechanisms that might contribute to failure to recovery are highlighted, along with clinico-pathological correlations that allow development or use of novel biomarkers that diagnose AKI early or herald non-recovery.